I'm pretty sure I've passed on a Raspberry CRB before but I might get one this time around. This is really pretty but I'm not loving the fabric on the newest Scuba IIIs lately. About time a slit was put in for GPS watches. The Swiftly LSs badly need this feature. Updated to show what the back of the 5 Mile LS looks like. It's already out in Hong Kong. I'm a sucker for tie dye so kind of liking this print. This new bra style isn't bad, though it looks a bit Champion-ish to me. Pace Queen tights are back. I've been reading about random people getting gifts sent to them from lululemon consisting of Pace Queen Tights in a slate/black Mini Blooming Pixie print and a gray What the Sport SS. Anybody got one of these packages? It's a pretty nice gift. Any bets on the price point for this sweater? Next week, What We Love with be posted on Thursday. $198? 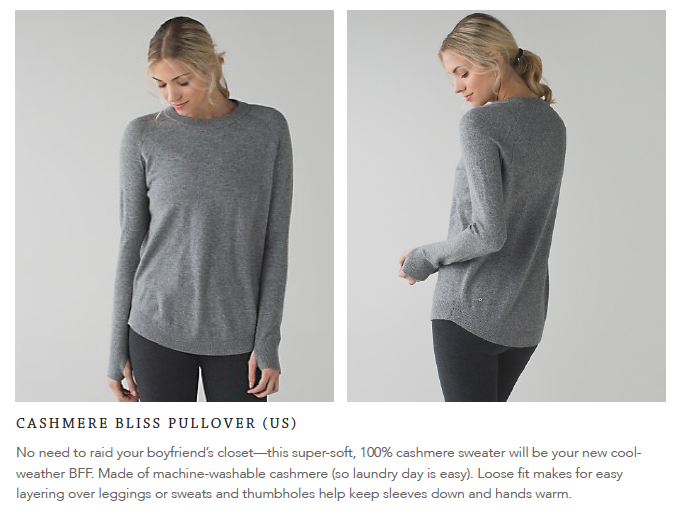 For the cashmere sweater. My guess is $198 for the sweater as well. Yes! Totally agree that the swiftlies need a GPS watch slit! The sleeves are so tight it's sometimes hard to even push it up. Lately i've just been putting my watch on the top of the sleeve. Looks a little dorky but I don't care. Lol! Not a whole lot of "want" on this list for me. Wallet is happy about that. So, I think that LLL has had a lot of misses this year. IMO they should have implemented some type of some cohesion in the items released and a strategy for releasing said items. However, with that said, for the items that they do seem to get right, I applaud them. I just took my new pair of toasty tech tights out for a run in <20 degree weather and they were AMAZING! Comfortable, warm, nice pocket size. Perfection. Now I'm excited for the long sleeve with the hole for checking your Garmin! I wonder if the 5 mile LS will be lighter weight than the swiftly. It says light luon, but what is a swiftly made of? 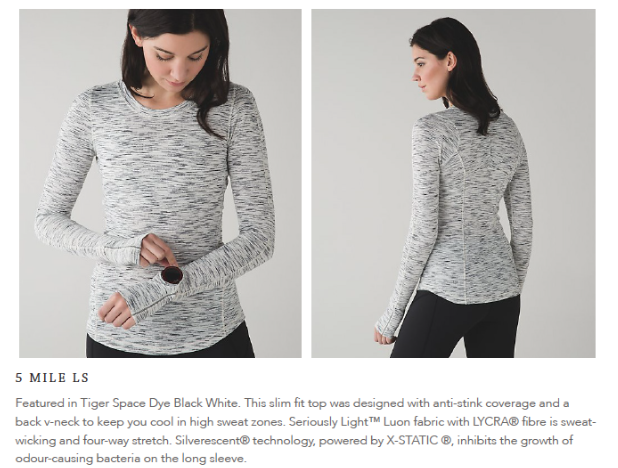 5 mile long sleeve top description says back v- neck. Of course model's hair covers that area in the picture..I get tired of seeing hair instead of the items that are being modelled. ditto guessing $198 on the cashmere. I like the mini blooming pixie raspberry multi print. I like the bra style too. Gotta be more than $198! I say $278 for the cashmere. Not sure lulu had ever done full on cashmere before! Gonna be pricey! YAY for a smart watch slit! So annoying trying to get to it with your sleeves over your thumbs. Agree with Julia that it will probably be $198. Lulu seems to be releasing items at grossly inflated prices and then marking them down. This is a really dangerous game. It teaches customers not to buy without some kind of sale being involved. What's so funny is that this is the opposite of the "scarcity" strategy that we all hated but which worked so well for them for so many years. Yes, they fired their product lead, but the CEO's been in place for what? Almost two years? And the company seems to have declined gradually, but fairly steadily in that time. I think the board needs to give him the boot. 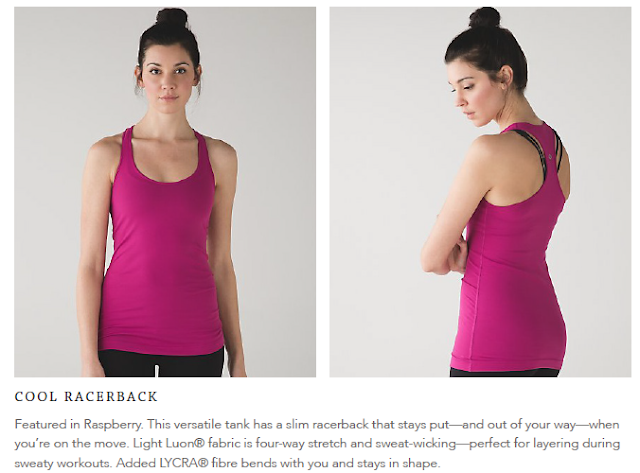 And Lulu product people: stop making stuff that looks like Nike and Under Armour. You can't release this crap and slap a Lulu logo on it and think people will buy it. With regard to this week's upload: the 5 mile LS could be interesting, but I'm a little hesitant about the V neck in the back. Sounds a little cheesy to me and I don't like the idea of an exposed upper back. Unfortunately, the pictures conceal this feature by having the model's hair cover that area of the shirt. Has this been uploaded to any foreign sites? Wow! How sweet it must be to get one of those gift packages! @ anon 8:38 pm - I think we're already at the point where people wait to pick things up on WMTM instead of at full price. They should absolutely go back to scarcity. They are making way too much product these days. As for the CEO, if there isn't marked improvement this next year, I agree he should go. His family still lives in SoCal so he isn't there for the long term anyway. 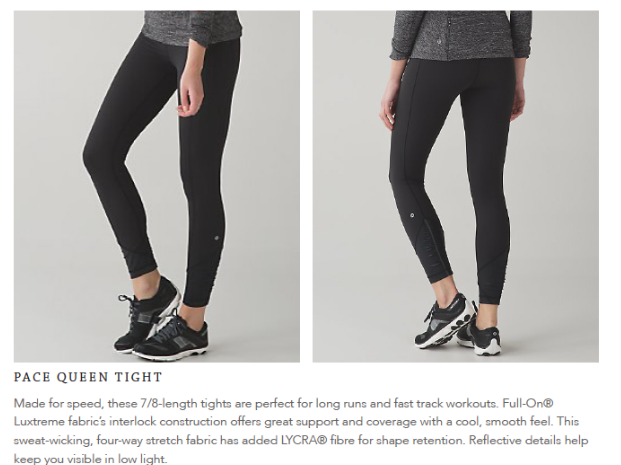 Agree about looking like Nike/UA/Athleta, too. @BIA - It's seriously light luon so lighter weight than swiftly and less snag prone. I actually prefer that they overstock, then mark things down. I don't like fighting my way on upload day to just buy a shirt I like. Ok, I take that back about the opening for the watch... 'if' it would only be a small slit that looks closed when not wearing a watch, it may be ok... I just don't like the idea of a gaping opening in the sleeve. Thanks for the photo of the back of the 5 Mile LS, LuluAddict. I think it would be a little more flattering with a curved neck, but the v is pretty subtle. I will definitely try this one on in store. I might be in the minority, but I hate the slit for a gps watch. There's no way that it won't warp/stretch out, leaving you with an ugly hole in the arm. I live in a cold climate, so if it's cold enough to want long sleeves, it's cold enough to not want another place where cold air can get in. Plus, most of the time I'll have more layers piled on top, so the feature is useless anyway. I wear my gps on top of my sleeve, and have started to prefer that. I now wear a wrist cuff under it in the summer as I hate sweat getting trapped under the plastic next to my skin. I was actually really disappointed to see the slit, because otherwise it looks like a really nice top. And I agree that the product photos online have become pretty useless for actually seeing what the product features are. I like the "v" of the back on that. The description made it sound like it was going to be a deeper V vs more of a style design V that it is. As an earlier poster said - there's no cohesiveness. I long for the days when Lulu would release a pant, crop, skirt, power Y, crb, bra in patterns and colors that all went together so I could literally buy an entire outfit in one sitting - a printed pair of wuc, the solid crb or power Y that went with, toss in a run skirt in the pattern to go with those tops and BAM! They had a crap ton of my money in one sitting and i'd keep it all because it not just all went together with those pieces but then those same pieces had matches to it from prior purchases. At Anonymous 2:18: I agree, a ton of design misses lately. The reason you like the Toasty Techs is that it isn't a new design but a re-release (seasonal) of a design from several years ago. When they actually designed great items with thoughtful touches (the quilting, the zip pockets etc). These were already in their "closet" so to speak designed years ago by someone that's probably not there anymore. I keep waiting and waiting for Lulu to go back to fun uploads, fun design details. We get teased with one or two items here and there but all in all I don't think Potdevin (or however you spell his name) has been good for the company. I would guess $198 for the cashmere, too. 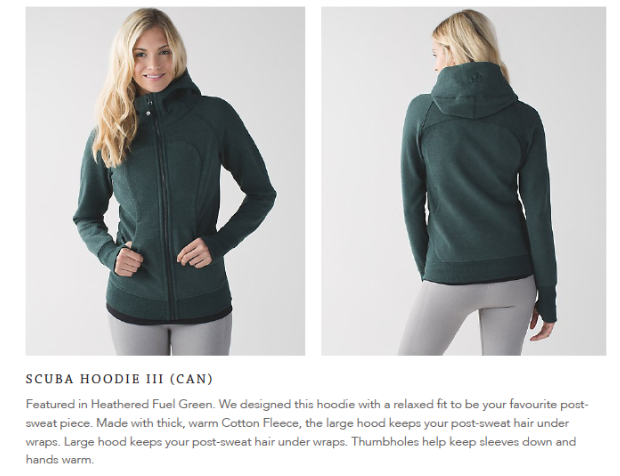 That is what Kit and Ace is selling theirs for, so I would think Lulu would be in line with that (and if it's higher, I'll just buy the K&A version!). Any insights into who got these mysterious freebies??? scuba 3 is not high quality at all!!! They screwed w/ a good thing again!!!!! wow i was so excited to have the scuba 2 having it like the version everyone knew and loved! Now its gone the 3 is flimsy and cheap no lining around the hood region so when its open you can see the cheapness of it and the way it drapes its horrible. I can't believe it i was so sad!!!! @anon 8:22 am - They are totally missing out on not releasing coordinating stuff as a batch - or more coordinating items - where are quilted waistbands on WUCs and Grooves not to mention Define/Daily Practice jackets - and getting people who love to build outfits in one shopping trip. 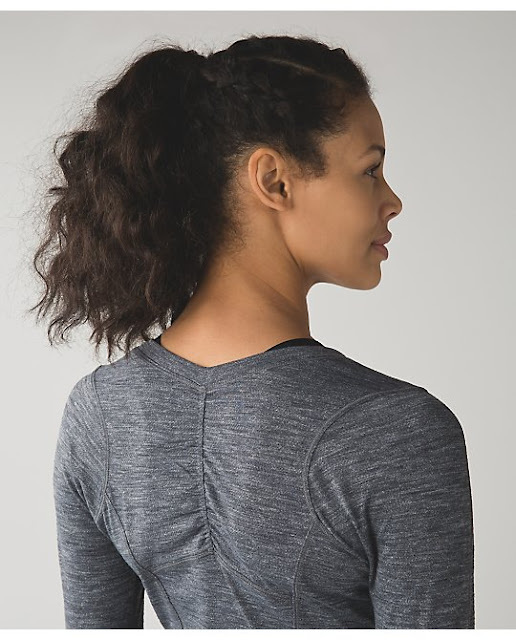 There are a few new items that remind me of "old' lululemon - the Mesh With Me LS and the Face the Frost half zip to name two - the are very nice technical pieces with some nice lululemon details - but they are few and far between. The could easily just mine their old designs and tweak them. However, I'm sure the way they were constructed was too costly. @ anon 3:14 am -I did like the first batch of Scuba IIIs that were thick and soft but the newest bunch seem thin and scratchy. @ anon 9:14 am - I saw a post by lululemon that said people from Edmonton and Phoenix area were getting gifts. I think it was from their facebook page. I like the watch slit and will likely buy this top because of it. I am a very lucky random recipient of the Lululemon gift box. I live in Edmonton and yesterday found a Lululemon package sitting at my front door. Sure enough, inside was the Pace Queen Tight and a grey What The Sport SS as well as what looks to be a gift card from Body By Bennett. Although it doesn't say on the front of the card that it is a gift card, the small print on the back says to treat it like a gift card but it doesn't show a value? I looked the company up online and it is a fitness studio so I think the card might be for free fitness classes. The outfit is very nice and I like the slate/black Mini Blooming Pixie print and the grey What The Sport SS looks good with them. However, I wasn't able to try on the tights being that they are a size 2 and I am a size 4. My first reaction was to return both items for something else for me but upon reflection I am going to pay forward this kind generosity shown to me. I am going to return the items and get a Scuba Hoodie and donate it to WINGS, Women In Need Growing Stronger, which supports and provides services to women and children fleeing family violence, taking little or nothing with them. I think this would make a wonderful Christmas gift. As to why I was chosen to receive this gift, I have no idea. I spend a lot of money at Lululemon and live in their clothing every day but that hardly makes me unique. All I can say is thank you Lululemon for inspiring me and giving me the opportunity to pay it forward. @luluaddict I can't recall your coloring offhand, but I have the raspberry CRB and am surprised by how much I can wear with it. It looks great with lulu's darker blue/navy based prints. I agree that LLL should go back to a scarcity model. They should return to great quality. Why produce a ton of crap and compromise quality, and thereby ruin your reputation? They've increased the cost of items to cover global production and shipping issues. You think you're getting a deal on wmtm but of course not: it's just the former, regular retail price and it's BS. I love how the financial reporters think that there are no (longer any) quality issues, however the long time loyal customer knows that there is. And all anyone has to do is read the product review (i.e. reporters). This company is all over the place. There is no longer a colour story. They are making items that mimic Nike, Reebok, Adidas, etc. What, if you can't beat 'em join 'em? Then they throw in the &Go stuff and it's just product ADD. For a few years now it is clear to me that they do not know what customer pays dividends for them, they do not know who their customer is anymore, so they are trying to go after everyone. And the new customer has no idea how inferior a lot of the product is now. Potdevin: I was hopeful about this guy but no longer. I think he is one of these CEOs who sees things from a "high level" only, very corporate, quality be damned, has no creative vision or input. Does not get who the customer is at all. (Except: let's go after more men customers, that will save the day!) Just make more money - which his current plan is not working - and all will work itself out. Quality be damned, these customers will still buy. I think we already know which customers are speaking with their wallets with fewer and fewer purchases, and refusing to be suckered. 5:57 that is really nice of you.